U.S. 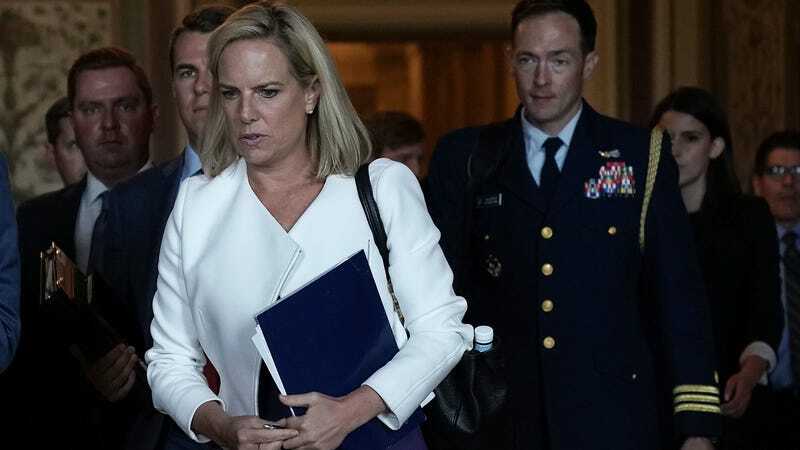 Homeland Security Secretary Kirstjen Nielsen at the Capitol Building in Washington, DC for a closed briefing in August 2018. The Bloomberg report claimed that the chips, which were the size of a pencil tip and allegedly ended up in server boards used by almost 30 companies as well as government agencies, compromised entire data centers operated by Amazon and Apple. It said that U.S. investigators had found that Chinese agents operating on behalf of the People’s Liberation Army had used a combination of subterfuge, bribery, and threats to insert the compromising chips during various stages of Supermicro’s supply chain, after which point they would have been nearly impossible to detect and given backdoor access to the systems they were implanted in. According to Reuters, Apple’s recently retired chief counsel Bruce Sewell said that after he had learned of Bloomberg’s investigation last year, he had been reassured by the FBI’s then-general counsel James Baker there was no substance to the report. The strong denials from companies involved, as well as government agencies, has led to speculation whether the original Bloomberg report was planted or otherwise inaccurate, or if it was quietly covered up in some manner on national security grounds. As the Register wrote, Apple and Amazon’s denials were unusually firm, and it’s possible that government sources overplayed the threat—though the site also found it “inconceivable that [Bloomberg] would publish a story this huge that wasn’t watertight.” A DHS denial certainly adds another twist to this story, though it remains to be seen whether under all the smoke, there was an actual fire.